Photographer not known at this time. The 100th BR/Sulzer Type 2 D5099 stands at Leeds on May 18th 1963, in much the same condition it was delivered in, having gained the small yellow warning panel and a coat of grime. The engine exhaust port is still in the original position. 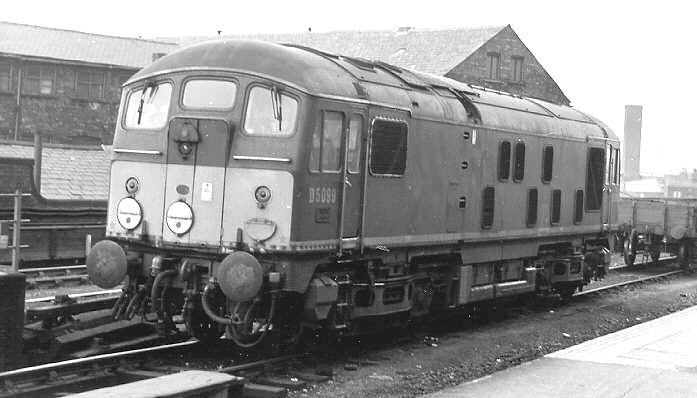 The fifteen year eight month career of D5099/24099 was split between North Eastern Region and Scottish Region depots. Built BR Darlington Works (batch D5094 - D5113). Shortened fuel tank & full size water tank (retained until withdrawn). Four upper and four lower air filters on non-BIS side, three upper and four lower on BIS side. Headcode discs centered on cab front (Glasgow modification). Circular gauge added to fuel & water tanks. Time between last Classified repair and withdrawal: ?? months. Time between withdrawal & scrapping: 17 months. February 1963 to York (50A). June 1967 to Holbeck (55A). July 1971 to Polmadie (66A). March 1972 to Eastfield (65A). August 8th 1975 - stored serviceable. 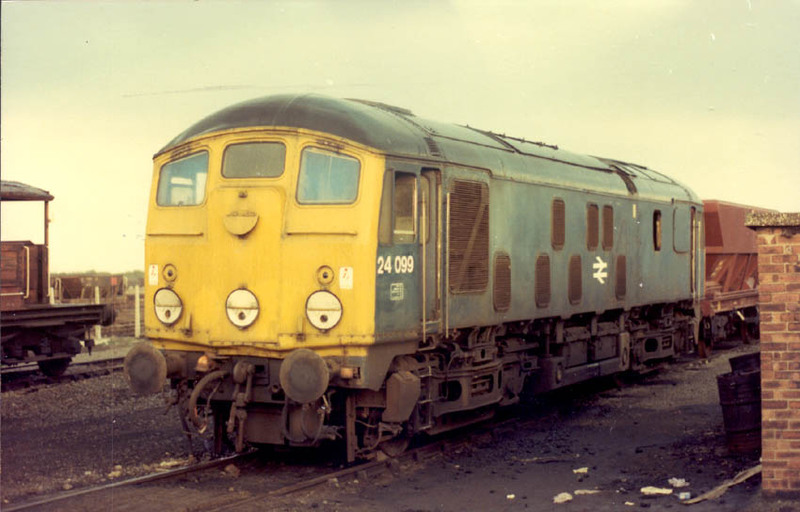 After withdrawal 24099 was stored at Eastfield from August to October 1975, then at Carstairs from October 1975 until April 3rd 1976 when it was forwarded to Doncaster depot. It remained there until September 1976 when it was moved over to Doncaster Works and broken up by July 1977. Noted Darlington Works August & September 1960. Noted Darlington Works September 1961. Noted Darlington Works October 1963. Noted Derby Works October 1967. Noted Derby Works November 1968. Noted Glasgow Works July & August 1969. Noted Glasgow Works August 1970. Noted Glasgow Works April 1971. Noted Glasgow Works August 1973. Noted Glasgow Works March 1974. Neville Hill diesel depot was officially opened on June 17th. Although principally servicing diesel multiple units, diesel locomotive servicing was provided, on display on the opening day were D278 & D5099. The North Eastern Region Type 2s had returned to handling the Newcastle - York - Leeds services, D5097 on 7.30am Leeds - Newcastle and 11.05am return (July 9th) and D5099 on 11.40am Leeds - Newcastle and 5.33pm return (July 9th). Condition May: green livery with small yellow warning panels, curved upper corners, steam style shedplate on cab front, engine exhaust in original position, full size water tank, shortened fuel tank, ridge sided sandboxes, three-rung bogie footsteps, no blanking plates, hand/footsteps present . As the diesel locomotive and diesel multiple unit fleets grew so the impact on steam workings escalated. Typical was the closure of Scarborough shed on May 18th, the two diagrammed steam freight workings turned over to D5096/8/9 & 5100/76 the following Monday. On May 28th the first turn, the 04.30am York - Scarborough led by D5100 had 77004 as pilot, destined for the Malton - Whitby freight. However cinders from the ashpan set alight to the diesel necessitating the service of the Malton Fire Brigade. The service resumed behind 77004, the diagram later being taken over by D5099 which later failed on the last leg of the run, at Rillington on the 07:49pm Scarborough - York mail. Rescue came in the form 43014. All was well by the Whitsun weekend, June 2nd, when seventeen specials worked into Scarborough, the Sulzer 2s handling two, led by D5099 and D5176. D5099 was noted in Darlington Works during in October. On Sunday March 7th noted on York shed were D5096, D5098, D5099, D5100 & D5239. June 6th saw D5099 work a two coach inspection special of the West Riding, including a complete run over the internal loop line used to supply coal to Eggborough power station. D5099 visited Derby Works during October. Photograph collection of webmaster. 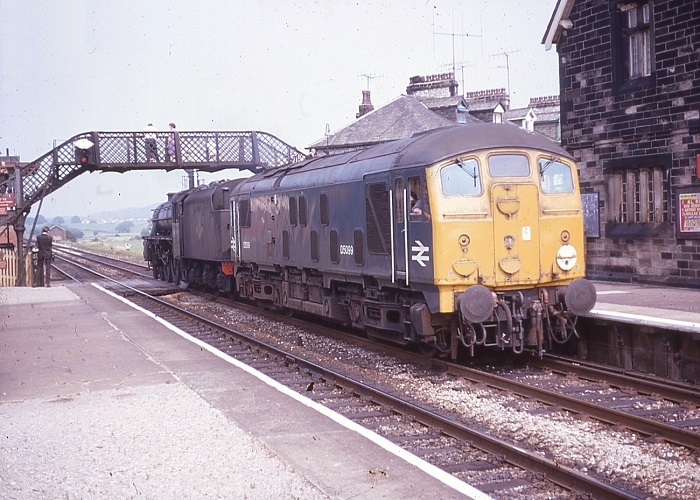 Class 24 No.D5099 and Class 5 4-6-0 No.45017 pass through Hest Bank station on July 27th 1968. Regular steam operation on British Railways has about a week left. Condition August? : blue/yellow livery, gangway doors present, two numbers on each bodyside, emblems on each cabside, full size water tank, shortened fuel tank - both equipped with circular gauges, no blanking plates fitted, hand/footholds in place, three-rung bogie mounted footsteps, ridge sided sandboxes, most valencing still fitted, steam style shed plate on cab front. 5099 visited Derby Works during November. Glasgow Works was visited by 5099 during July & August. 5099 was noted at Glasgow Works during August. On August 29th 5098 & 5099 (both in blue livery) worked a twelve coach mystery excursion from the Whitehaven area to Cleethorpes, running via Carnforth, Skipton, Leeds avoiding line and the Doncaster avoiding line. 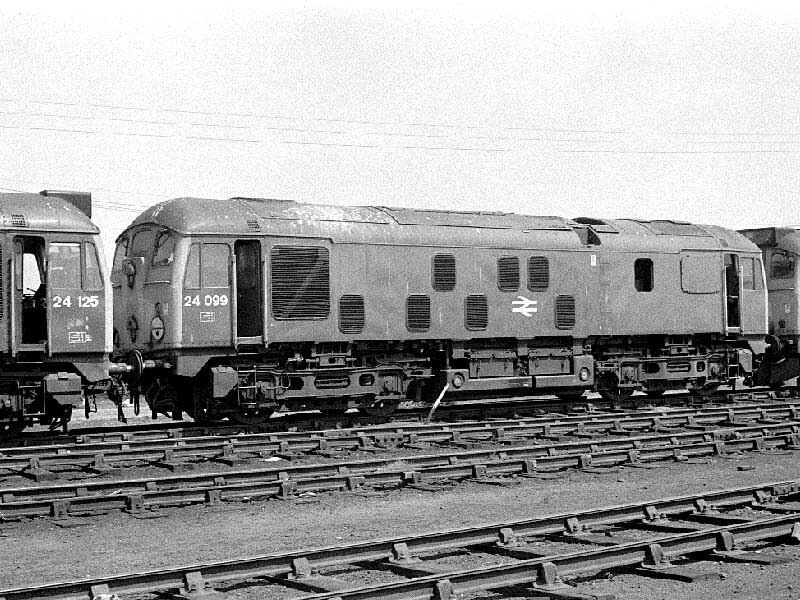 It is presumed the Class 24s worked throughout. 5099 was noted under repair at Glasgow in April. A re-shuffling of the fleet took place to bring to an end the few remaining NBL & Claytons locomotives on the Scottish Region. Part of this plan involved Type 2s from Gateshead & Holbeck, 5099, 5100/101 moved to Polmadie (66A) in July, whilst 5096/97/98 followed in October. When Polmadie shed closed in March 5098 - 5101 moved across town to Eastfield (65A). 5099 was noted at Glasgow Works during July. On August 18th 5099 & 5090 worked a lengthy Invergordon - Glasgow cruise special. 24099 was noted at Glasgow Works during March. A page from the repair book for 24099 shows an entry on May 20th (reported by a Grangemouth driver) indicating the panel lights in No.1 cab were not working. A second entry (in different handwriting) reported poor performance, only 500 amps. In response the fitter examined the traction motors, reg air valves were all tested, the load regulator contacts cleaned, the locomotive was then tested several times, now recording 2,000amps. 24099 was stabled at Motherwell shed on August 4th 1975. The major fleet rationalisation that took place during the summer of 1975 saw 24099 placed into store during August, then withdrawn during February 1976. 24099 moved from Carlisle to Doncaster on April 3rd 1976, spending five months dumped on the depot prior to movement to the Works and scrapping by July 1977. Photograph courtesy Tony Sayer. A sunny June 13th 1976 finds withdrawn 24099 on Doncaster depot. The fuel & water tanks have gained circular gauges, the handholds to the roof lever water filler have been plated over and in true Glasgow fashion the upper & lower central discs have been centered on the cabfront. Photograph collection of webmaster. Another view of 24099 at the back of Doncaster depot, although the locomotive is pretty much intact the windscreen wipers are missing, perhaps an item of scarcity back in Scotland. The style of sandbox has changed when compared to the view below. Condition final: blue/yellow livery (yellow paint extends to cabroof gutter rail), gangway doors sheeted over, headcode discs centered on cab front, full size water tank, shortened fuel tank -both fitted with circular gauges, blanking plates fitted, hand/footholds plated over, three-rung bogie mounted footsteps, flat sided sandboxes. Page added September 1st 2016. Last updated March 30th 2019.